In this section I answer questions related to Vedic Astrology. You can ask any question and if I think the question is suitable and have time I will answer it. Please refrain from asking about your own horoscope, such questions will not be answered. 1: How important is exact determination of auspicious muhurtas for performance of Vedic samskaras? 2: There are two Yogas: Kala sarpa and Kala amrita. Can you tell me a little about them, especially Kala amrita Yoga. I read that they are very inauspicious. What can one do against it? On what must one pay attention while upbringing, if a child has one of these Yogas in horoscope? 3: Is Numerology as practiced today useful? A candid appraisal of the subject. 4: I was wondering whether you could clarify whether one should use True or Mean Rahu? 5: What is the actual time we should take as the "Time of Birth?" 6: A reseacher asked: "Why [in Vedic culture] do women wear rings on the left hand and men on the right?" 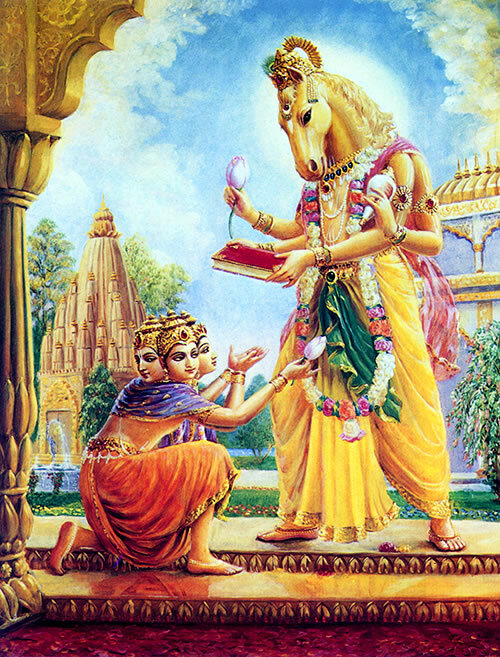 The demiurge Lord Brahma, recieves the Vedas from Lord Krsna in His avatara of Hayagriva.